Centuries ago, artists were often supported by a patron who believed in their past work and wanted to give them the freedom to continue expressing themselves without worrying about financial constraints. Few of us can afford to be an artist's primary patron today, but 150 backers committing $10 per month can have the same effect. 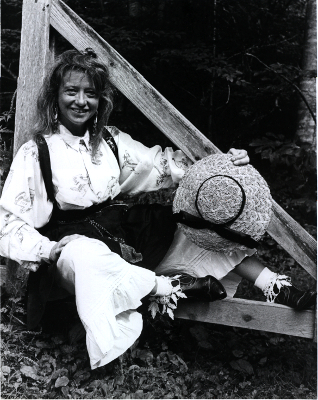 Classes --- Anndrena will be teaching flatfooting and old time dance calls to young people and families at the Mountain Music School (Mountain Empire Community College, Big Stone Gap, Virginia) on July 25 and 26. Her classes are right after lunch and are free to the the public. She will also be teaching students at Dungannon Intermediate School about oral history as a followup to her well-received performance last September. Performances --- You can catch her performancing as part of Anndrena and The Wildboys, with an upcoming appearance at The Down Home and another at Home Crafts Day Festival on October 20 or 21. Ridin' Route 23/75 --- This collection of stories, essays, songs and living memory vignettes captures the experience of Appalachian families migrating to Chicago in search of work in the mid to late twentieth century. Passing It On: Three Generations --- Anndrena curated an art exhibit at the Summit City Lounge and Gallery in Whitesburg, Kentucky, for Women's History Month in March and April, 2012. She is currently working on making some of the images available as prints. migrated in (in the 1950s and thereafter). I hope to transcribe the interviews, write the interviews into a book, and we want to do a documentary film following the same folks OUT of Uptown, as the manufacturing disappeared, and gentrification and Urban Renewal (REMOVAL) took place." All contributions are 501(c)3 tax-exempt donations. Thanks in advance for your donation!